Before the advent of GIS cartography has been in existence for so many years, I guess some of us where not born when map making came to play, the end process of cartography is called A MAP GIS stands for (geographical information system) One can’t really talk about GIS without making reference to cartography, back in the days surveyors, cartographers, geographers encountered a lot of difficulties while making maps because the instrument available as at that time where manual tools such as T-square, inking pen, drawing tables, protractors, compasses etc. where as in the modern age things have really changed drastically. with the advent of GIS, GIS has played so much role in map making such as it saves time, saves cost, efficiency, it helps in decision making, GIS can be used in making several map analysis both spatial and non-spatial analyses. GIS as a tool can be applied in several areas such as Flooding risk mapping, waste management, crime mapping, malaria risk mapping, wind mapping, agriculture, military, drought, desertification, etc. there are other fields in which GIS can be applied in which I may not have mentioned because I don’t want to bore you guys with so much applications of GIS. Raster data usually are inform of grids, we have two types of raster continuous and discrete. Example of continuous raster are temperature and elevation measurement and for discrete we have population density. In every images there are cells the smallest unit of an image is called a pixel so each cell has a pixel value ranging from 0-255. Primary data basically is a data which one collects directly from the field or recent images from a satellite imagery. Data can be collected through hand held GPS (Global Positioning System). Secondary Data is a method of data collection which is collected from existing source, such as maps, charts, documents. Although the Data I will be using to show you guys this practical is a secondary Data. one of the disadvantages of secondary data is that sometimes you don't have a choice you just have to use it like that when you couldn't get a primary data. the software is like a tool which is used in the mapping process. key software components are OSsoftware, network software, GIS software. The methods are more like the standards or guidelines which are used in the map making process of GIS. People are the personnel’s who use this tool, the people are me, you, GIS technicians. 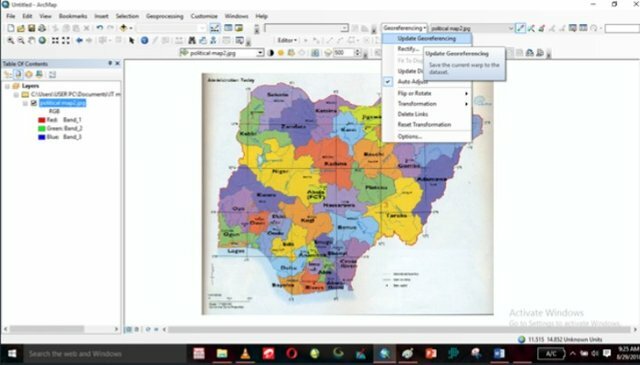 GIS is a tool for all irrespective of your profession. Hardware deals basically with the physical part of a computer which can help you achieve your aim in your Arc GIS. Data is one of the most important component of GIS without data it’s impossible to carryout spatial analysis with your ARC GIS. data can be manipulated, it can be retrieved, it can be arranged, it can be stored, it can be integrated, it can be processed, it can be distributed etc. 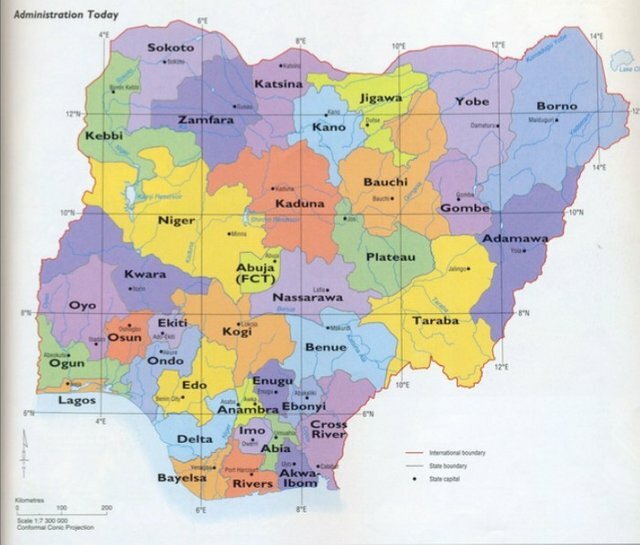 • This is a map of Nigeria showing all the states and capital, Nigeria is a Country in westAfrica, popularly known as the Giant of Africa this data is a secondary data and already used data before. 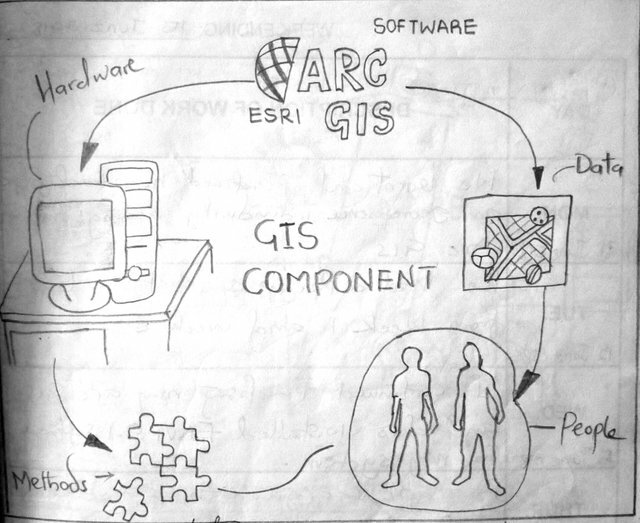 Before we go into the main business let me give a brief history of GIS how it came about. 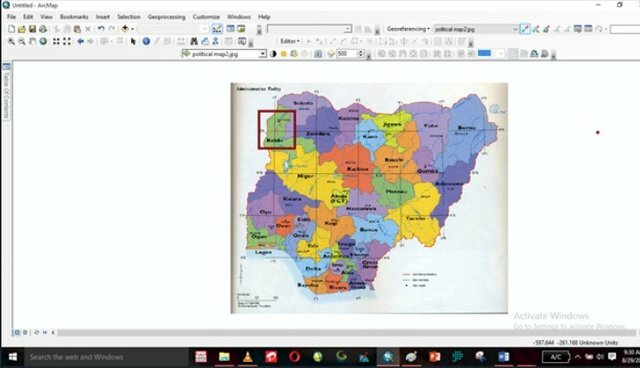 GIS came about due to advancement in technology, computer mapping, programming, mathematics etc. 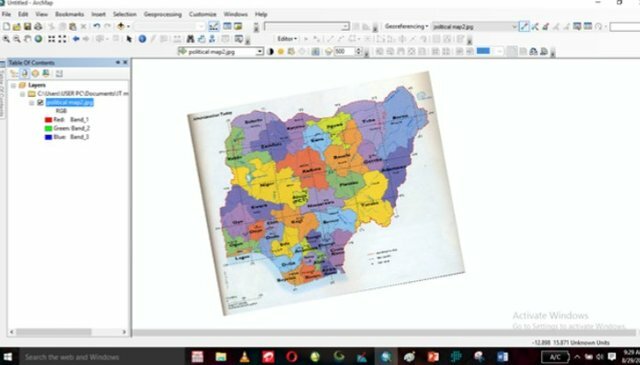 but computer science really have a great impact on GIS. GIS all started in 1854 when there was an outbreak of cholera in the great city of London, a popular physician by the name Dr. John Snow took it upon himself as a problem which was needed to be solved so as to reduce the mortality rate in the city. Many people were thinking the disease was through the air, john snow used maps to prove how cholera in the city resulted through a water pump which was more like one of the major pump supplying water to the community. However, this map shows how cholera was being spread through water in the city of London, john snow made maps showing the outbreak location (where this incident was centered upon), property boundaries and water lines. When he finished adding all these spatial features to a map that was where he discovered that CHOLERA was the major cause of death in the city. However, John Snow was able to connect geography and human health with the help of his Cholera map, this was the beginning of geo-spatial analysis. 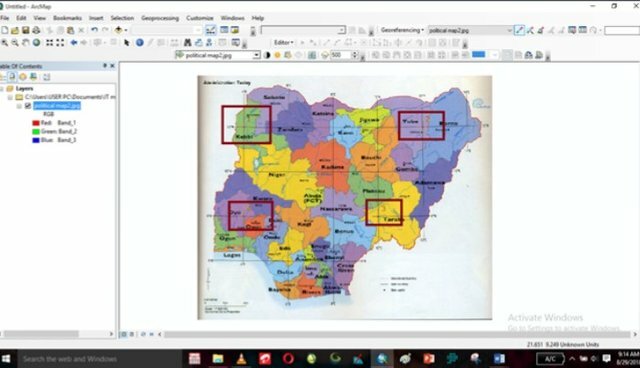 With the solution in which John Snows map proffered it is a Sign that GIS is a Problem Solving tool, GIS helps in decision making. 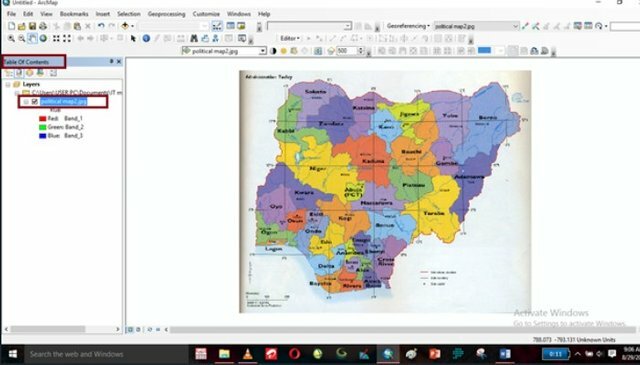 • Using Nigeria Map as a secondary data, this was the only Data i could lay my hands on. After you must have launched your Arc GIS software on you system it is expedient you understand the main scope of georeferencing. 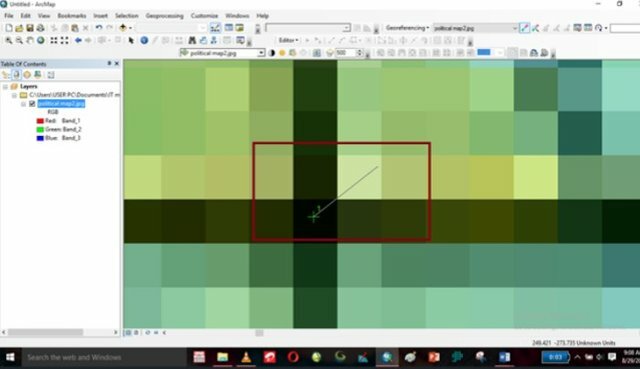 Anywhere you see a Red ring circle or box on any icon which I indicated on the images below, pay attention to it because that’s the step process I’m going to explain as we go further and you would need a good Mouse so as to enjoy the process and be able to gain one or two things as we proceed. 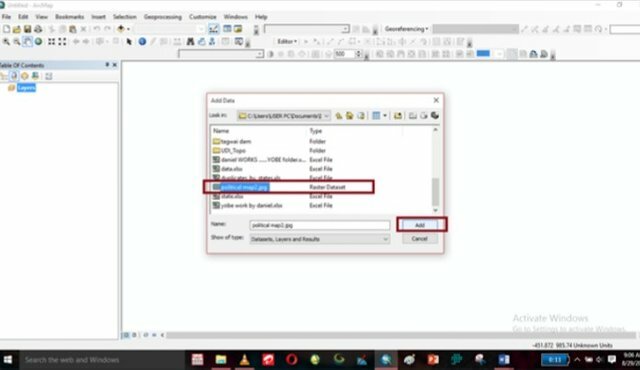 • After launching it, it will appear as the image below show an empty space on your work environment. • Click on the add data as signified on the image. 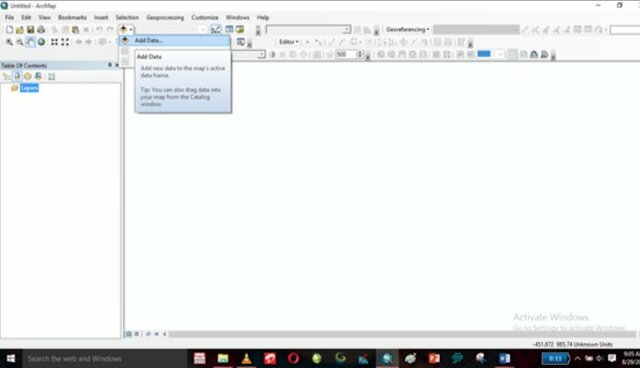 • Take a look at your table of content you would see that the Data is added there with the name (political map2). • If you look closely on the map you would noticed some boxlike lines, those lines are called the GRID lines. This grids are more like scaling the map using coordinate points so as to help in possible cases of georeferencing. • But before you go further try and pick out the point where you want to georeference eg. Although this are the points we would be using though. 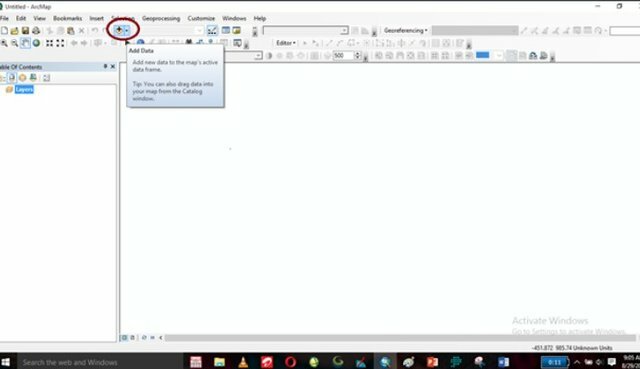 • After locating the intersection point click the middle point move your mouse to any direction either right or left. • Click at the point of intersection move it right or left. • After inputting the coordinates click on ok.
• If you experience anything like the image below click on the globe🌐 inside the red circle indicating Full Extent as shown below. the procedure for POINT 1 would be applicable to POINT 2, ignore if I use the image from the first inputation of point 1 so please don't get confused. • Please ignore the x=4 and y= 12 because it is the coordinate point for point 1.its not meant to be used from pont 1. There are times when if you input the coordinates wrongly the map would TILT or change position this is an error on your path, but the great new is that there is a possible solution to rectify this. 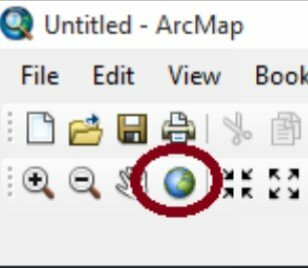 In order to rectify this you have to click the VIEWLINK TABLE it is an icon at the georeferencing tool as represented in the image below circled with the red ring. This is just an indication if you encountered any difficulty while trying to add controls to your points while goereferencing. This is how the image would look like after deleting the points on your view link table, like the image above shows that the second point has been deleted. 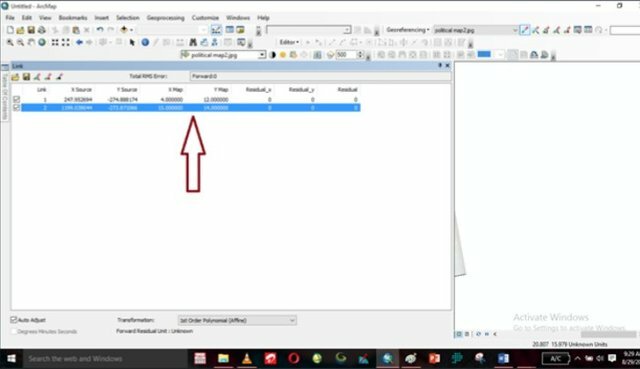 • However it will reach a point that when you click on add control point you would see that the coordinate point would be having decimals i.e, the coordinate would look I this format. 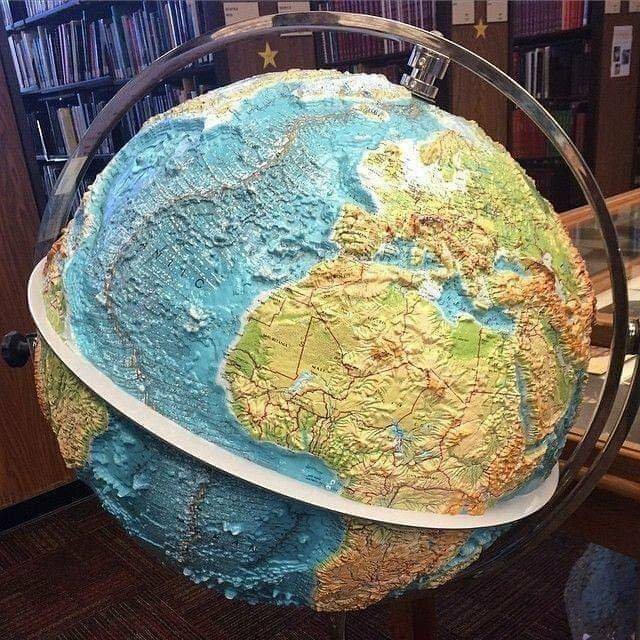 • The map would look in this way on the image below. Ones you update georeferencing it will clear all the points on the map eg point1, 2, 3 & 4 leaving the map properly georeferenced like this, the essence of update georeferencing is to make the map georeferenced for further use anyone can make use of it without going through the stress of georeferencing again. GIS is a very good software which helps so much in conducting several analysis, take for instance the john snow's map how he was able to save a community from further spread of cholera so you see GIS can't be applied only to Geography, Geology and Surveying alone it can be applied to various fields even in marriage, football, one can apply GIS i hope this little tutorials would help. UPVOTE and RESTEEM if you like what you saw thank you all. If you haven't followed my blog please click the follow button to see more articles from me. 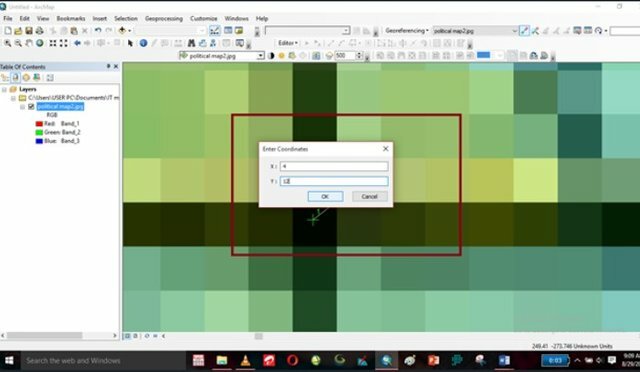 All Images showing those maps where screen shots from my system just to explain the whole process i didn't copy it from anywhere. I am personally interested in this. However, I think there might be copyright issues with some of the images used on your post. You might want to fix that first. Which of the image are you talking about? 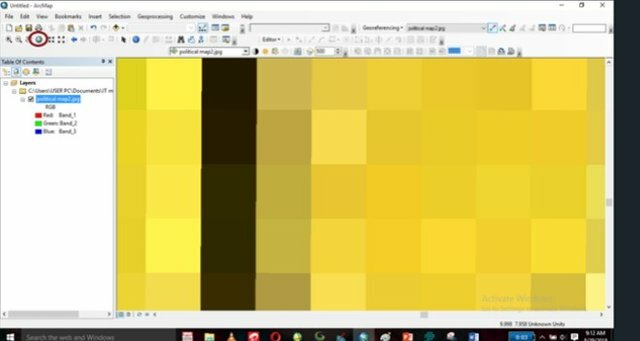 The first image was an image i got from the net and i referenced it with a link, while the other images are image of screenshots frm my system, i screenshoted them while working to as to explain steps of this process. Images must be copyright free aka, free to use. You have to state the kind of license for every image.